Which set should the private at attention pose be in? ...and feel free to add any other comments or thoughts you might have regarding poses or MAC in general. Not sure I understand the question or the poll. It's not 1st April is it? All other poses in MAC format would be standing (which includes marching) in some shape or form...surely. I will compete the poll but only when it makes any sense. Thank you. For a standing at attention pose, Command seems to he the best place for it. It would also be fine in the Action box, but Command is definately the better place for it. Though, you could do the same as Strelets and occasionally release a full box with everything standing at attention. You don't necessarily need to make new master models, as you can just digitize some of your older master models and make a new dedicated box set out of them. Food for thought anyway, but you need to digitize your older sets so you can release an updated MAC box set of your older sets. Thanks for the clarification. I'd say this looks like a colour guard or NCO, so my vote goes with the Command set. I'll complete the poll.. It's a man standing at attention, not color guard or NCO. I think the standing pose belongs in the marching set because he's waiting ready to start marching l would stand them behind the marching figures in my army. Plus I don't want to lose any of the true command figures from the command sprue for a standing pose. Before deciding in which group to put the standing figure in, can you confirm there is room for it to go in the Command box as at present we already have 5 figures and a horse plus any Shakos or backpacks etc. Thanks for asking the question Admin. With the action set, I'd like to see more variety in the advancing poses. In the SYW Prussian set, the two advancing poses are very similar, whilst it looks like it will be a similar thing with the SYW and Nap Austrians. 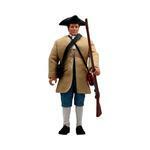 I'm no fan of the standing at attention pose, whether you put it in the action or marching boxes people will be unhappy! Also, I was going to comment but the thread got locked before I got the chance, but I think the sampler sets are a great idea. I assume it doesn't cost you much extra to produce, and hopefully doesn't slow your other projects down. Hopefully they will sell well enough to encourage you to experiment with future sampler sets etc. I believe the attention poses are vital to accurately represent all the major movements (or lack thereof) of Napoleonic Armies on campaign (Of course a set dedicated to camp activities would be nice). I've had my say elsewhere, let the majority rule. This is a general question for future sets. Although many people will find a use for this pose I don't care for it a great deal. I love the old MAC format where Marching are marching, Action are in action and Command are, well, in command! Unless you want a "standing still doing nothing set" like another manufacturer there's no real place for him in the old MAC format. I didn't like the inclusion of a standing figure in the French elites in greatcoats but still used it rather than waste it. What Hat decides to do is up to Hat, it's not my decision to make. Admins last comment mentioned this was a general question for future sets. I'm not a collector of ancients, medieval or 20th century periods but surely you wouldn't be considering this pose for those eras as well, would you? To me it would seem entirely out of place, but again, what Hat does is up to Hat, and some will like it others will not. Thanks for asking the question, I chose the marching option as it would be a pose that I would need many of this pose as not all units were involved in action and this pose can act as a unit on its own or as a rear rank pose. I have chosen 2 flag bearers because many countries have 2 flags in their units and older sets lack flag bearers altogether I generally buy many multiples of each set and it would be great to have that flexibility. Horse-Holders and Horses to Hold"). Then again, perhaps not. 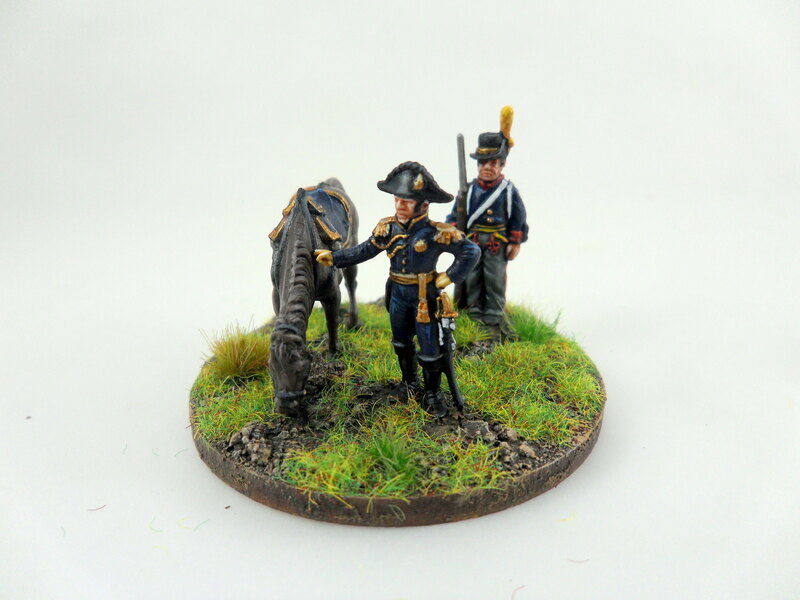 The Spanish Napoleonics have that pose. It makes for an excellent unit - waiting in reserve. They paint up very well. I would not be disappointed seeing that pose in a marching set. Please, Do it in a command box. Well, in fact I have no need of one standing pose figure, I'd rather prefer more skirmishing and marching figures and also the command ones. I've done some thinking on it and if folks don't (understandably) want the standing pose is the Action set it should probably go into the Marching set. I state this because even though standing at attention isn't necessarily marching, it is, nonetheless a standard position in drill and, as has been stated before could be used to represent troops waiting in reserve or preparing to march. I've done numerous scenarios - some of which could be found on old ETS where that is exactly how I've used the pose. I have one formation (or more) representing a unit(s) marching either onto the field or going forward at shoulder arms, with another formation(s) standing at attention waiting for orders to go forward. I might even have another unit in advancing poses with bayonets forward representing units further along in the attack representing an "en echelon" attack. In my opinion, you might not want or need the standing at attention pose in a 20th Century set (but from experience, I know modern soldiers also spend some time in the stance - even if it's now usually at sling arms - just not on the battlefield) - but it is a very important pose for 18th and 19th C warfare; that is if you want to adequately cover the movements of armies during the period. So you don't want to sacrifice firing or loading poses? I also like advancing poses - it was done under fire. The Command Sets are doing good to cover the necessary elements as it is; after all, most regiments had TWO color bearers - one for the national and the other for unit colors. Putting the standing figure in with them would probably cost a needed pose while at the same time fail to meet the need for numbers required to build a decent-sized formation of troops at attention. I think Marching is probably the best place for HaT and its model for set configuration. I do not see HaT developing a mini-set of troops at attention after all the stink over their recent mini-sets. The attention figures would be a logical extension of the movement and placement of troops, I do not believe the placement of even two per sprue would greatly reduce the numbers of marchers while at the same time a common complaint of HaT's Marching sets is the number of poses. I KNOW this won't please everyone, but I think it's the most expedient way of keeping the molehill from becoming a mountain. At the same time, I think it's important we realize that for some of the sets at the front of the queue, it may be too late to make any changes in configuration. There comes a point when HaT HAS to "pull the trigger" on a set or the things might never be made. Remember the story of "Too Many Cooks?" A "Standing Pose" is not an Action Pose nor is it a Command Pose. Therefore I would recommend including them with the "Marching Set." (NOTE: Standing Poses are a very necessary pose for any army Infantry or even Cavalry. I personally like them a lot! In my Collection they would give extra value to the Marching Set. Plus, there are already too few Action and Command Poses as is).